Refrigerators are essential to the success of any foodservice establishment. 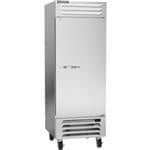 Every commercial kitchen needs at least one refrigerator to store cold items and keep them fresh. This ensures that you produce high-quality food products that are safe for consumption for your customers. To help you choose the right commercial refrigerators for your needs, we have prepared a comprehensive buying guide that will walk you through everything you need to know to buy a refrigerator that is right for your needs. For a complete selection of high-quality refrigeration units,click here to check out CKitchen’s full array of commercial refrigerators. All refrigerators provide the same basic function of keeping food, drinks, and cold items cool. However, some refrigerators are designed with specific uses in mind. For instance, some units are best used by kitchen staff for back-of-house operations while other types are most beneficial when used in customer-facing areas. Certain types of refrigerators will not fit in establishments with restricted space. Some specialty refrigerators are also designed for a certain purpose, such as worktop refrigerators. Take a look at a more detailed description of the different types of refrigerators below. Practically every commercial kitchen has at least one reach-in refrigerator. That’s because reach-ins are practical and versatile, with the ability to store a wide variety of items, from fresh produce to baked goods and bottled beverages. Reach-ins keep your items cool and accessible at arm’s length. 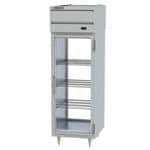 Staff can easily retrieve its contents simply by reaching inside the cabinet, thus their name. There’s a wide variety of sizes for reach-in refrigerators. The smallest units typically have a single door and measure around 26” in width while larger models can have up to three doors and a width of 87” and above. Reach-in refrigerators are best for back-of-house operations. They are to be used only by staff and not by patrons. These units are not made to display food items, although some models have transparent glass doors that allow staff to monitor the items inside. 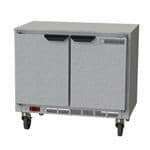 Pass-through refrigerators have doors situated on the front and rear ends of the units. This allows users to access refrigerated items whichever side of the refrigerator they may be. 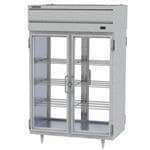 This type of refrigerator is useful in large, busy industrial kitchens where staff need to access the items in a pinch. It is also helpful in establishments where back-of-house staff can quickly transfer food items to be accessed by staff working in the front of the house. 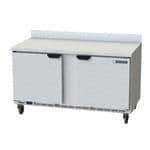 They are also useful in cafeterias where the kitchen staff can fill the refrigerator from the back and customers can retrieve the contents from the front. Pass-through units used for cafeteria settings typically have glass doors so that customers can see when their item is available. Like reach-ins, pass-throughs are available with one, two, or three doors and sections. They may either come with full doors and half doors. For commercial kitchens that want to maximize every nook and cranny they have, undercounter refrigerators provide a compact solution. These are not meant to be a substitute for reach-in refrigerators because they can only store a few items, but they provide extra refrigeration space that can be easily tucked into an out-of-the-way corner, such as under a front counter or a prep table. Many undercounter refrigerators come with a heavy-duty worktop that can serve as a preparation table for light food items. The refrigerated storage underneath allows staff to reach for ingredients they need right away without having to walk to a unit that’s farther away. Some models also have a backsplash to protect walls or nearby equipment from food spills during food prep. Undercounter refrigerators are best used for prep and cooking areas, such as at the griddle, where the chef needs easy access to fresh ingredients. 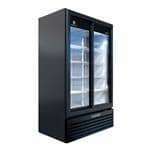 They are also useful as an underbar refrigerated storage space in bar areas. 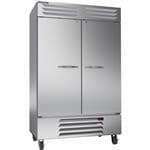 Walk-in refrigerators have the largest storage capacity. These allow you to store crates of bulk ingredients, making them most useful for establishments that store large quantities of food products. Staff can easily access all refrigerated items simply by walking into the cabinet and taking them from the shelves. Walk-ins range from as small as 6 sq. ft. in size to custom-built boxes to fit all your cold storage requirements. For establishments with high-volume output, walk-in refrigerators are very cost-effective because of the low purchase cost per square feet of cold storage. They are also heavily insulated to ensure excellent refrigeration. Cafeterias, institutions, and large-scale restaurants will benefit from investing in a walk-in refrigerator. Most walk-in refrigerators are located in receiving areas, where staff can directly receive deliveries and load them straight into the walk-in. Refrigerated merchandisers are similar to reach-in refrigerators because their contents can be accessed simply by reaching in. However, merchandisers are designed to put food products on display. They are used primarily by customers, not the staff. Merchandisers have glass doors that allow customers to see what’s inside. They are perfect for encouraging impulse buys, thus they are placed in the front of the house. They are also commonly seen in convenience stores and supermarkets, where customers can quickly grab an item from the merchandiser. Merchandisers have either swing doors or sliding doors. Swing doors provide better sealing, but swing doors are beneficial in stores with narrow aisles. Most units have self-closing doors to ensure that all doors are always closed and that customers do not accidentally leave them ajar. Many merchandiser units have bottom-mounted compressors that allow for easy cleaning and maintenance. The bottom-mount system also raises the lowest shelf so that customers don’t have to bend over when reaching for an item. Worktop refrigerators allow you to prepare food products while providing storage space for the ingredients of that specific product. These often come with prep accessories, such as cutting boards, food pans, and storage hoods. Worktop units are usually found in the mid-kitchen or near the front counter, where staff can quickly prepare the food products and get them to the customer. Examples of worktop refrigerators are the sandwich table and the pizza prep table. Dual-temperature units are structured like reach-ins. However, they come with two separate temperature zones to accommodate different types of products. Usually, dual-temperature units have a refrigerator and a freezer. Dual-temperature units come in all sizes. They are best used in commercial kitchens that don’t have a lot of space for a separate refrigerator and freezer. These units are reserved in back-of-house operations and kitchens that need to access cold and frozen items in the same area. 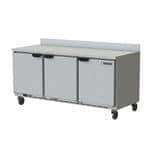 A refrigerated base is a sturdy unit that can accommodate other kitchen equipment on top. Typically, countertop ranges, griddles, or broilers can be mounted on a refrigerated base. This is a great way to help you make the most of the space in your commercial kitchen. It also cuts down on prep time because staff at the cookline have easy access to the ingredients they need. 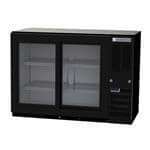 Bar refrigeration units are necessary for storing alcoholic drinks. These ensure that your items are kept at the right temperatures and they retain their taste and quality while in storage. Bar refrigerators can accommodate bottled and canned drinks. Some models have glass doors, allowing you to display your bestselling beverages behind the counter, while other units have solid doors for keeping under the counter. Direct draw beer refrigerators are a special type of bar unit that lets staff store and dispense tap beer straight from the keg. This save times and efficiency while also attracting customers with the prospect of drinking beer that is taken directly from the keg. Some models even have glass doors to showcase the keg being used. A more common type is the bar cooler, which may have solid or glass doors, depending on your needs. Some manufacturers are also coming up with a hybrid unit that combines a cooler to store bottled drinks on one side and a direct draw system to store tap beer on the other side. These refrigerators are designed primarily to showcase food products to attract more customers to buy them. They are seen in front-of-house operations, delis, cafes, bakeries, supermarkets, and grocery stores. Although they can keep food at the right temperatures, they do not have the same preservation capabilities as other types of refrigerators. 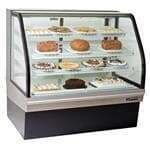 The following are specific types of refrigerated display cases. Sushi display cases are used in restaurants to display sushi and appetizers. They are not designed to store food items overnight. Open display cases can be horizontal or vertical. 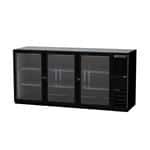 These provide a space for you to display food items while keeping them refrigerated. Open display cases are usually seen in cafes and delis. Refrigerated bakery display cases are used to display baked products that need to be refrigerated, such as cakes and cupcakes. These units typically have a curved, angled, or straight glass front that keeps customers from reaching inside and taking food items. Deli display cases are used for sliced meats and cheeses. They are also commonly seen in sandwich shops and supermarkets. Some refrigerated units are used for specialty applications. Milk coolers are used specifically to keep bottles of milk cool. These units are typically found in K-12 schools. Some milk coolers have lids while others have side doors that allow grade school children to access the interior. Another type of specialty refrigerator is the drop-in cooler. Drop-in coolers either have an ice well, a cold wall, or a forced air system to cool the interior. Ice wells don’t have a refrigeration system and are cooled using ice that is manually placed inside. Ice wells have drains to empty the water that is produced from the melting ice. Cold wall drop-ins have refrigerant lines installed within the walls of the unit. This provides maximum cold contact with the products. Forced-air systems work like most other types of refrigerator. They blow cold air into the unit to keep its contents cool. The frost top is another specialty refrigerator. The frost top sits flush with the counter and cools products that are placed on top of it. It is best used on the serving line where you need to keep packaged cold items on hold. Some models come with a hot-and-cold combination to keep hot and cold packaged goods at the right temperature before serving. There are a few ways to help you figure out the capacity of your refrigerator. First, look at the dimensions. It’s best to check both the external and internal dimensions because units with the same external width may not have the same internal measurements. For example, a side-mounted compressor can make a unit longer but still retain the same interior capacity as a shorter top-mount refrigerator. Check the manufacturer’s specs sheet for the width and cu. ft. capacity of the unit. These are the most direct representations of how much the refrigerator can store. Knowing the width is useful for determining where you want to place the unit, while the maximum capacity lets you know how much the refrigerator can store. The number of doors in reach-ins and pass-throughs can also give you a rough idea of your refrigerator’s storage capacity. Single-door refrigerators are most useful for same-day operations. They are used for quick access and fast service and must be restocked from larger refrigerators. Single-door units are usually located near the final production line. Most single-door refrigerators typically measure 27” wide and with an internal capacity of about 20 to 25 cu. ft. They typically have a single section as well. Refrigerators with two or three doors are better for storing bulk items. They are normally found in prep areas towards the back of the kitchen and are usually restocked weekly from walk-in units if you have them. Multiple-door units normally have multiple sections that allow you to better organize your items. Refrigerators come with full-size doors, half-size doors, solid doors, and glass doors. To know what type of refrigerator door you need, look at the entrances to your kitchen, the doorways, and the aisle widths. Full-size doors make it easy to load items. They often have a stay-open feature that allows you to place or retrieve a large number of items without having to hold the door open with one hand. However, full doors can potentially block traffic, especially in kitchens with narrower aisles. They can also lead to refrigeration loss if you’re constantly opening the doors. If you need to do a lot of door opening, half doors may be a better alternative. Half doors are swing doors that are split into two sections. Although there’s still a chance of blocking traffic in small spaces, half doors can help promote energy conservation and reduce refrigeration loss because you only have to open a smaller door at a time. Refrigerator doors can also be solid doors or glass doors. Solid doors provide better insulation, making the units more energy-efficient. However, you won’t be able to see the contents. Glass door refrigerators, on the other hand, provide less insulation but allow users to see the contents of the unit. Staff are not as likely to open the door for long periods of time because they can stand in front of the refrigerator to find what they need first. Other door features you want to inspect include the door handles. Some refrigerator doors are fitted with recessed handles. These are more durable than bar handles because they are built into the construction of the unit itself. Bar handles, on the other hand, are attached to the doors and run the risk of breaking off. You also want to look at the door gaskets. Gaskets provide an airtight seal around the door edges to keep the cold air inside the refrigerator. Look for gaskets that can be removed easily without needing extra tools. These make cleaning faster and maintenance less of a hassle for staff. Some doors are also equipped with locks, which allow you to provide an extra layer of security for your refrigerated items. Self-closing doors are also useful, especially for customer-facing refrigerators such as merchandisers. These make sure that all refrigerator doors are closed even when a customer accidentally leaves a door open to prevent lost refrigeration and keeps energy costs down. They’re also useful for staff who have their hands full. Some refrigerator doors even have a pedal opening, which is a hygienic option because you don’t need to touch the door at all. Another thing you may want to look for are reversible doors. These can be changed from right-hand opening to left-hand opening and vice versa simply by detaching the hinges and moving them to the other side of the door. Reversible doors can be very convenient in areas where there is not much space to work with. The compressor is used to draw in air that regulates the internal temperature of your refrigerator. Compressors are mounted on top, at the bottom, or away from the refrigerator. The ambient temperature in your kitchen affects what kind of mounting you need. Top-mount refrigerators have the compressor, condenser, and evaporator placed above the storage cabinet. Because warm air rises and cold air sinks, top-mount systems are best used for cooler environments. The heat expelled from the condenser rises above the unit and the refrigerator “breathes” into the top instead of towards the workspace. Top-mount refrigerators also have slightly more interior capacity than bottom-mount units. The top shelves are easier to reach but the bottom shelves can be uncomfortably low for taller people. They are also more difficult to clean since you have to reach higher to get to the compressor. However, since top-mount shelves are less likely to be clogged with dirt and debris because of their location. Bottom-mount refrigerators have the compressor placed below the cavity while the condenser and evaporator are situated above. These units are ideal for hot environment because the low compressor pulls in cool air from the environment. These units normally have less storage space than top-mount refrigerators. That’s because of the refrigerant lines running from the compressor to the condenser that are installed throughout the cabinet and that are taking up space. Because the compressor is located closer to the floor, it can accumulate dust, dirt, and debris easily. However, it is also easier to clean because the compressor is very easy to reach. It’s best to place bottom-mount refrigerators from areas that put out a lot of it, such as the cooking area, to keep the compressor from working too hard with all the hot air that it may pull in. Remote refrigeration systems have their compressor located away from the box, typically in a separate room or outside the building. These can be costlier than top-mount and bottom-mount refrigerators upfront because they require a separate installation for the remote components. They also need refrigerant lines that travel from the compressor to the refrigeration box and back. 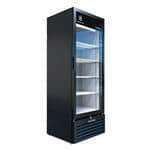 However, remote systems are great for refrigerators in very hot and humid environments because they do not produce extra heat into the workspace, thus reducing air-conditioning costs and increasing energy efficiency. They’re also ideal for walk-in refrigerators. Digital thermostats let you manually set the temperature of your refrigerator. They give you great control over the internal temperature to ensure that your items are kept at the optimal temperatures. They are typically paired with a digital display so you can keep an eye on the temperatures all the time. Some units can even be connected to your phone or computer to let you monitor their temperature even when you’re away from the kitchen. Shelves make it easier to organize the contents of your refrigerator. Many shelves can be adjusted in height by removing and inserting them in various positions. Some refrigerators have a lever that lets you adjust the shelves. Shelves can be wire shelves, which are useful for holding pans of food items. 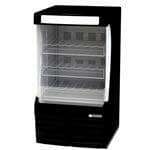 Other refrigerators have attractive glass shelves, which are great for use in merchandisers. Some glass shelves are made with a lip around the edges to catch spills and prevent liquids from dripping down to the lower shelves. Some refrigerators tend to develop frost over long periods of time, which can drastically compromise their performance and shorten their lifespan. Having a manual or automatic defrost system helps to reduce the chance of this happening. Newer models have a high-tech door alarm. These units have sensors that can detect if the door is left open. If the system does detect that a door has been open for long periods of time, it will sound the alarm to let you know that it needs to be closed. Having high-quality insulation is crucial to keep a refrigerator energy-efficient. Look for refrigerators with at least 2” of foamed in place insulation, which is insulation that is sprayed all throughout the cabinet. Foamed-in insulation is more efficient than blocks of foam that are simply inserted between the interior and exterior panels. Interior lighting helps make looking for food items easier for you. Newer models use LED lighting, which is bright, energy-efficient, and does not get as hot as fluorescent lighting. 1. Figure out what you’ll use it for. It may seem obvious, but you need to know what types of food you will be storing inside the refrigerator. You also need to know if you’re buying a refrigerator for kitchen use, in which case solid-door reach-ins, pass-throughs, or dual-temperatures may be ideal, or if you want a refrigerator to be used in public view, in which case you may want to look at units with glass doors. How much you need to store will also affect what size of refrigerator you choose. If you’re refrigerating mass quantities, a walk-in refrigerator with a remote compressor is ideal. For small spaces, undercounter refrigerators are useful. More specific applications also require more specific equipment. If you have a salad bar or sandwich shop, a sandwich table with a worktop is useful. If you have a bar, look at your numerous beer storage options. A bar cooler can hold bottles and cans, while a direct draw system holds a keg and be more attractive to customers. Knowing where and how you will install your new refrigerator can help make the process easier. You can also avoid redesigns in the future if you have a clear installation plan now. The first thing to consider is how you will get the refrigerator inside the building. Smaller units will fit in with no problem, but you’ll have to think about fitting two-door and three-door units through the kitchen door. Walk-in boxes are larger but can easily fit through most standard doors because they come disassembled. Always provide good ventilation for your refrigerators. Provide extra clearance around the back and sides of the unit to allow for air to circulate. Look at the manufacturer’s sheets for the minimum amount of clearance required for specific models. Make sure the refrigerator is installed in an area with good ambient temperature. Hotter temperatures can cause system breakdowns and void the warranty. Keep the refrigerator away from humid areas because the extra moisture in the air can cause rust to develop in the condenser. Are you looking for your next refrigerator? Check out CKitchen’s full selection of commercial refrigerators here.